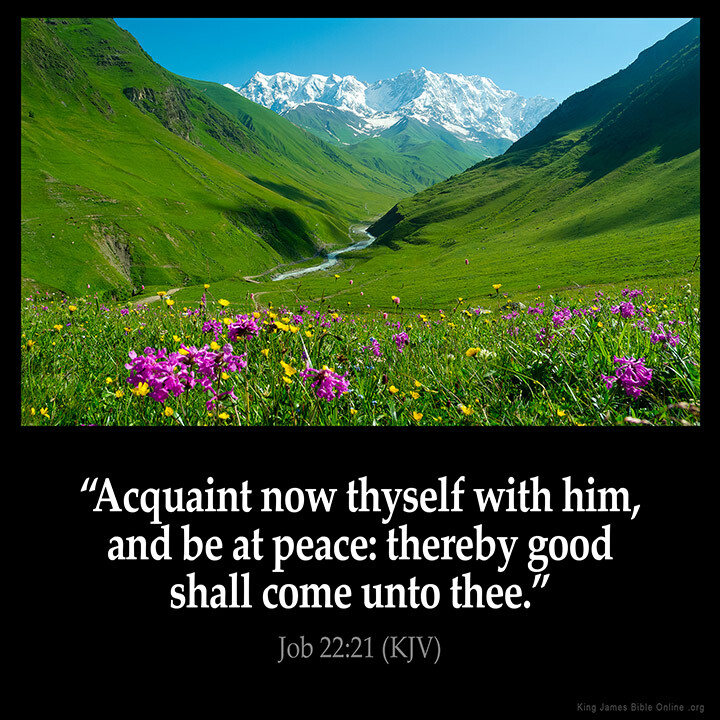 "Acquaint now thyself with him, and be at peace: thereby good shall come unto thee." "If heaven looks anything like this I gotta go"
"Old school bible it would be easier to say get a relationship with god and awesome things will be yours"
"Today is the day! Time is at hand. Turn to God Almighty and Christ Jesus Y'shua Messiah!! Amen!" "That was Eliphaz the Temanite speaking. who was Job's friend. God said something at the end of the book about what Job had said, and what his friends had said. Let me refresh your memory and we should all know that the book of Job was his friends talking for most of the book, and then God speaks. God said: Job 42: 7 �And it was so, that after the Lord had spoken these words unto Job, the Lord said to Eliphaz the Temanite, My wrath is kindled against thee, and against thy two friends: for ye have not spoken of me the thing that is right, as my servant Job hath." "Amen Amen GOD IS AWESOME ." "Amen oh what a beautiful picture that is! I know heaven will be as or just as peacefull as that!" "Amen.... "Thank you Dear God""
"And it did and it will be much more than you expect"
"Devil is raising to block this page,our payers for this page it got lot of persecution." "I love to walk with Jesus in this beautiful this picture speed time with Him and keep talk with Him Amen!" "I receive this in Jesus name! Amen"
"Its so nice having to see Bible verses online.I was blessed.keep up..."
"Job is always a source of reflection and reconsideration. Amen." "Needed to hear that ...thanks to God's Word!!!!" "So greenery beautiful nobody but god!!!!" "Studying the scripture definitely does do a person good." "The messiah is pure love and grace. Love him with all of my soul mind, body. God is very, very mercy and love." "This is the verse I keep on my kitchen window sill ??"